My words are few today because life is going at its usual lightning speed right now. So what’s new? But life is good and birthdays are super good. And watching your daughter open presents and having your husband make her dreams come true are all beautiful things. He was the mastermind behind finding a signed first edition of Night Circus and surprising her with it yesterday morning. Having an innately sweet and generous mastermind of a hubby also definitely makes my list of perfect things. Although no human is perfect, his kind heart and overall general dadness is sheer perfection. These cupcakes are perfectly evil though, insanely dark and chocolatey in part due to the black cocoa and mostly due to the volume of chocolate and the added malt for richness and over-the-top-ness. Why black cocoa is not on all grocery store shelves I will never know. Just like black holes and the darkest parts of the sea, some things are an eternal mystery. And to make matters worse, or better, it’s all how you look at it I guess, this cupcake was topped with a whipped, creamy malted chocolate frosting so it can make its final descent(ascent?) into evil awesomeness. So, if you need perfection and evil awesomeness all in one cupcake, make these. Never in my life have I been more sure of anything. Need a cake version of this cupcake? Then go here to my Whopper of a Cake post. See, I am very versatile over here at S&C. Recipe heads up! Make the frosting first…it takes about 2 hours to refrigerate. To make the cupcakes: Line two muffin pans with cupcake liners. Heat your oven to 325 degrees. In a stand mixer or mixing bowl, combine oil, buttermilk, yolks, and vanilla. Beat 2 minutes with a paddle attachment or with a hand mixer at medium speed. In another bowl, sift together (or use a wire whisk like I do to avoid sifting) sugar, flour, cocoa(s), malt powder, baking soda and salt. With mixer on LOW speed, add one third of the sifted dry ingredients to oil mixture and beat until blended. Then add one third of the hot water and slowly combine these (you don’t want the hot water to splatter on you…ouch!). Continue this process, scraping down the bowl often until all ingredients have been add and mixed. Using an ice cream scoop for ease, fill each muffin liner 2/3 full. Bake at 325 for about 20-25 minutes testing the cupcake for doneness (clean toothpick when inserted into a cupcake and cake should be springy when you lightly touch it). Cool for at least 45 minutes before frosting. Make the frosting: Melt the chocolate in the top of a double boiler (when I am in a huge rush, I melt chocolate in the microwave in a glass container 45 seconds at a time, stirring in between. If you use this shortcut, do not over cook, chocolate will seize. Heat, check, stir, heat a little more, repeat). In a stand mixer or mixing bowl, with a wire whip, combine malt powder and cold cream. Whip on high speed until stiff peaks form, but are not dry. Transfer to another bowl, cover and place in the refrigerator while you do the next steps. In a mixer bowl with a paddle attachment, put sugar, ROOM TEMP cream cheese and vanilla inside. Beat on high speed until creamy, about 1 minute and scrape bowl. Add melted chocolate to cheese mixture and beat 1 minute on medium speed. Remove bowl of malt cream mixture from fridge and add 1/2 of the mixture to the mixing bowl. Beat on medium speed until it is incorporated Fold in the remaining whipped cream until the mixture is a uniform color. Transfer the mixture to another bowl, cover and refrigerate at least 2 hours. This frosting is a creamy non-pipeable frosting. It is best spread on rustically with a frosting spreader or butter knife. Ok Geni, these look amazing on so many levels. You have me salivating. I have been in my kitchen this week being the mad professor whipping up all kinds of weird and wonderful things and now you have me thinking of gourmet cupcakes. How oh how can I make gluten free , sugar free cupcakes that can taste like that? Hmmm you have me thinking……… I will have to work up to that I think! Awesome! I love the black cocoa! Check out my GF page or my recipe page for the chocolate GF cupcakes. They are totally evil awesomeness as well but they DO have sugar so you will need mad scientist that out and switch it up which I KNOW you can Amber. Let me know how it goes! Thank you for stopping by Kailey. You have my attention! 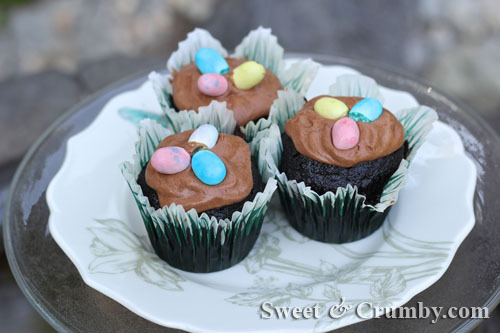 I will be searching for black cocoa powder after seeing these scrumptious cupcakes! Malted milk powder and chocolate are a winning flavor combination! The only place I have found black cocoa powder is on KAF and I think I am going to be stock piling it from now on. In case of nuclear disaster or such I will have plenty. Ooh, chocolate malt frosting sounds delicious! It is creamy and ridiculously addicting. My daughter made truffles out of leftover frosting and rolled them in cocoa powder for evil awesomeness squared! Evil awesomeness…I love the term :–) That sounds like something totally forbidden. Have a relaxing Sunday, Geni. It aptly describes these cupcakes. You too have a relaxing Sunday Angie. Thanks for coming by! I am curious if you find any other than KAF. Good luck my friend. You might need it. Otherwise,just use really good cocoa powder and all will be well. No worries. Hi Barb, my daughter loved it and she is a literary genius if I must so humbly admit, but I have not read it yet. It’s on my “next to read” list and I will let you know. I believe it is a Young Adult book but sometimes the best of those are quite worth the read. Happy 15th Birthday to your daughter Geni. NOW, these cupcakes – these are perfect! Thank you Mandy. We have quite the celebration around here. Those cupcakes looks perfect! happy 15th to your daughter. Thank you so much Raymund. I will pass on your good wishes. The more the merrier. omg Geni- just STOP IT! You are making me drool all over my keyboard for goodness’ sake! These look beyondddd amazing! Wow! What kind of art?? It’s beautiful!! Are you implying the dark arts? 😉 Could be when it comes to these cupcakes. Thank you! Thank you John. Watching her open gifts from her friends was actually pretty amusing…she got books, Barnes and Noble gift cards, Kindle cards, bookmarks and a book bag. I guess they know her well. 😉 You can definitely spend next birthday over here. We really do them up BIG! These cupcakes are gorgeous!! Happy Birthday to her! What a sweet thing to say Kristy. I know you and I are frequently on the same parenting page and our kids just make us so proud and happy. Thanks for your kind words and for stopping by. What a great gift for your daughter! I bet she was so happy 🙂 That frosting looks amazing. Wish I could stick my finger in it right now for a taste! I did take a big pinch of it now and then. It was too good to resist. Thank you! I definitely need some of that black cocoa powder in my life! Along with a batch of these. they sound like forces to be reckoned with! Yes, black cocoa powder is a MUST, however I know you have just moved and are supposed to be paring down. Hm, Joanne? 😉 hide it under your bed! those cupcakes have to be the cutest things I have ever seen! They are so dainty and cute and DELICIOUS! They are just calling out to me- more like screaming out to me! These look scrumptious, and I love malt!